On a typical day on the trail, P is usually the first one up...at about 6:30 or so, which is just about when he gets up at home. He gets dressed and goes out of the tent to get the breakfast out and starts it cooking, leaving M still cozy in her bag. Admittedly, cooking breakfast isn't exactly gourmet duty--he just heats up a quart of water--enough to make our oatmeal, hot chocolate and leave some to wash up a bit. And there is no fire, because we almost never light a fire in the back country for many reasons. But P also usually makes the day's sandwiches during this time...so our lunch is ready to go before we hit the trail. M gets up a bit later, so by the time she leaves the tent, the breakfast is ready. Oatmeal, hot cocoa, some dried fruit and a bit of coffee for M is how we start the day--often with some walnuts or almonds chopped up in the oatmeal. We eat in camp, or down by the local lake or stream. After breakfast, we usually get right to work. That's our kitchen at left. If M gets an early start, she packs up the sleeping bags etc. before she comes out of the tent for breakfast. 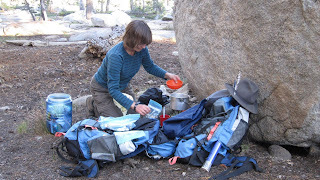 When we set up camp, we put ALL of our various storage bags for sleeping bags, tent, sleeping pads, tent stakes, etc., all in the main tent bag---that way we don't ever have to look for them later. The sleeping bags are stuffed, and everything is packed up, and then packed away in our backpacks right after breakfast. This is always a bit of a moving target. On some days, M runs a little behind as she puts on various lotions and creams, while P is a bit ahead. 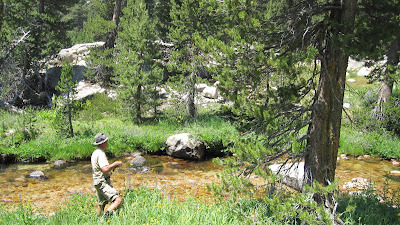 And sometimes P has to wait for the groundcover and tent to dry out a bit, so he runs behind. Either way. we help each other catch up by sharing a lot of the common tasks. Which means that on almost every trip, we're on the trail well before 9 a.m., and sometimes before 8 a.m. That includes having pumped enough water through our filter for us to get through lunch without worrying about it. Once on the trail, we hike more or less together, but P is in front and M further back. 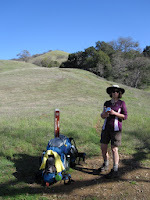 P waits for M at every trail junction or scenic spot...and also just when it seems like a good time to have a rest. P also is the photographer, so even though he hikes faster, he never gets too far ahead without having to stop to take a photo. And we do stop about every hour or so to have a bit of a snack and to drink some water. That's M resting on the trail at right. On warmer hikes we'll actually drink every 20-30 minutes. At home, P rides a bicycle pretty fanatically, and he is well aware of the dangers of dehydration! Lunch is usually at a scenic spot, ideally near water, so that we can drink as much as we want. On most days we'll only stop for about 30 minutes---just time to eat and relax a bit--before starting off down the trail. But if the spot is really beautiful, or if it is going to be a long day's hike, we may stop longer and give ourselves a chance to rest. Given that we hike a bit less than 2 miles an hour as an average, and we hike about 8 miles a day, we are often at our next campsite by the early afternoon. We spend a little time picking out a nice campsite; not too close to the water, with a good view, and few bugs, and a nice flat spot for the tent. In the best of all possible worlds, it will have some nice big flat rocks to sit on, and maybe a windscreen to cook behind. And then we usually set up the tent right away. That's come in handy on a couple of trips, when we ran into some afternoon thundershowers. With the tent set up, we just hopped inside and waited for it all to blow over. In the photo below right, it took most of the night for that to happen...and not before we got a few inches of snow! The rest of the afternoon is spent exploring, fishing, bathing and generally enjoying this amazing mountain range. We'll pump water to have enough for dinner, and sometimes we'll wash our clothes as well, so the afternoon is our "domestic chores" time of day. M reads, P fishes, and we both have big grins on our faces. Dinner is usually right about 6 p.m. M boils up the water, and we eat/drink a cup of instant miso soup to start, then add a freeze-dried backpacker's entree as well. Some dried fruit, an energy bar, and a bit of dessert fills out the menu. We find a nice spot to sit, and eat together, looking at the view and chatting about the day's activities and the the rest of the trip. Sometimes we'll spend more than an hour just sitting there, watching the shadows lengthen at the end of the day. After dinner we wash up and put away the bear canister again, and then almost always take a short hike up to a nearby peak or knoll, just so that we can watch the sunset in living color. These are very slow, relaxed hikes--we've already bathed, so we don't want to get sweaty again--but they have taken us to some of our favorite places, and photos, of all time. 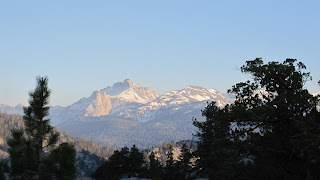 Above left is a shot of Crown Peak from the Hoover WIlderness taken on our evening walk near Cinko Lake. We're always back in camp well before dark, to brush our teeth, make a final trip to the toilet, and get into bed. With no fire, we are often in the tent by 9 p.m. M reads a bit, P usually just lies there and enjoys the quiet and the mountain air. And we're asleep by ten. Repeat as needed until all signs of stress have disappeared!